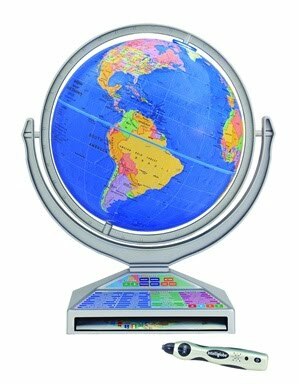 The Intelliglobe by Replogle has been the hottest selling interactive talking globe for the 2010 selling season, why? Simply put, features! Using a wireless pen reader the user is no longer tethered to the confines of the globe. 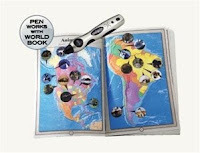 Now you will be able to use the pen for not only the globe, but the included reference book and future product releases. wnload the lastest updates and additional languages which are currently English, French, German and Spanish. For full details on whats included and how to use the intelliglobe and pen you can click here for the brochure or go to our webstite for further details. In addition to the various locate games there is a tremendous amount of information about 1,000s of places and ponts of interes. If you are looking for the perfect educational gift for the child that is 5 years of age or older, this would be the one. 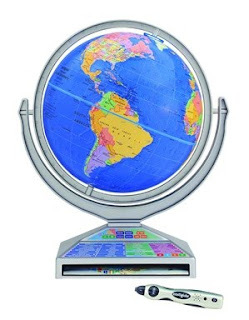 Visit us at UltimateGlobes.com today and save over $20 on the Intelliglobe or call us at 877-745-6237 ext 101 and we will be happy to answer any questions you may have.